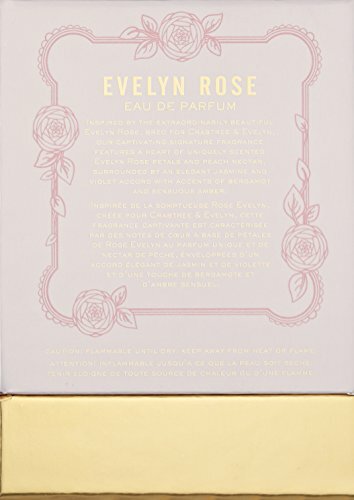 Crabtree & Evelyn Rose Eau de Parfum 50 ml. Discover the luxurious and ultra-feminine Evelyn Rose fragrance that celebrates all the graceful qualities of a modern-day woman who exudes sophistication and understated elegance. Using innovative technology that extracts scent molecules directly from the petal, our signature fragrance beautifully captures every nuance of its namesake rose. Breakthrough technology delivers true reflection of the rose in full bloom. A classic, elegant fragrance that can be worn both day and evening. Glamorous satin metallised bottle with gold cartouche finishing. Formulated without parabens, phthalates, mineral oil, or propylene glycol. Apply to pulse points and layer over Evelyn Rose Bath & Shower Gel and Body Lotion for a long-lasting fragrance experience. Fragrance: A heart of uniquely scented Evelyn Rose petals and peach nectar, surrounded by an elegant jasmine and violet accord with accents of bergamot and sensuous amber. Breakthrough technology delivers true reflection of the rose in full bloom.